Over the past three decades, the conduct of our foreign policy has been based on the premise that led by the US, the world would move towards progressive removal of barriers to international trade, and join a process of global economic integration or ‘globalisation’ of the world economy. This would involve a step towards freer movement of goods, investments, and services, which would be overseen by the World Trade Organisation (WTO). India accordingly dismantled its extensive trade barriers, signed Free trade Agreements with members of the SAARC and ASEAN and concluded similar arrangements on “Comprehensive Economic Cooperation” with Japan and South Korea. It is now involved in difficult negotiations to join a “Comprehensive Economic Partnership” across East Asia, including China. US President Donald Trump seems determined to dismantle this entire movement towards ‘Free Trade’. He claims that the US has suffered the most in the present world economic order and envisages new economic priorities—‘America First’. He has treated friend and foe alike in implementing new trade policies. He has served notice on his immediate neighbours Canada and Mexico, averring that he would dismantle the North American Free Trade Agreement with them, unless its provisions are amended to conform to American demands. He has asserted that he would build a ‘Wall’ across the US-Mexican border. American allies in the European Union have now been told that new duties would be imposed on crucial exports like steel and aluminium, unless they opened up their economy further. Asia has also felt the impact of Trump’s moves. 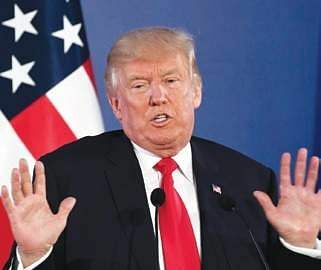 He has withdrawn from the “Trans-Pacific Partnership”, a free trade and investment agreement with countries across the Pacific, including Japan, Australia, Singapore, New Zealand, Vietnam and Mexico. Trump is also compelling Japan to offer trade concessions. While the European Union has won a temporary reprieve, by offers to negotiate, the hardest hit has been China, which faces the prospect of a further $60 billion of tariffs on exports to the US. Chinese threats of retaliation have had little effect on the Trump Administration. Trump has also served notice on India by filing a complaint in the WTO, claiming that India’s export incentives violate WTO rules. Given the fact that India has not fared too well in cases in the WTO on issues like its policies on imports of Solar Energy equipment, it is left with little choice but to negotiate a ‘deal’ directly and bilaterally with the US. It should also take steps to see that its rules and regulations do not face similar challenges from others. We are, in any case, set to import more from the US, on items like commercial aircraft, shale oil and gas and defence equipment, which would address American concerns on our relatively small trade surplus. China has a more difficult task, considering that is has a massive trade surplus of over $500 billion with the US. American tariffs on imports of Chinese steel and aluminium alone, would adversely affect $35 billion of its exports. Trump’s trade measures make it clear that he will be ruthless and not necessarily reliable in dealing with allies and foes alike. One should not be surprised if he links American trade sanctions on China, to China’s support for success of his forthcoming negotiations with North Korea. These developments could be used by us to talk frankly to the Chinese on issues like trade, maintaining peace and tranquillity on our borders and on reaching an understanding of our concerns on Beijing’s policies across the Indian Ocean Region and on South Asia, with particular emphasis on Pakistan. There are, after all, no permanent friends, or permanent enemies, in the conduct of diplomacy.